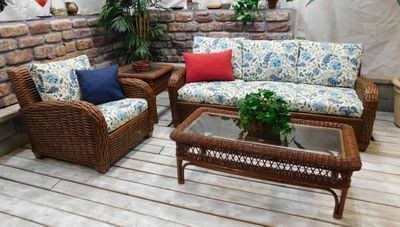 Reminiscent of by-gone dates, these nostalgic piece are constructed of the finest handwoven wicker over sturdy rattan frames. Queen Sized Mattress included. Prices include cushions in your choice of indoor/outdoor fabrics. Sunbrella Fabrics are also available at an additional charge. Antique finish only. Set of 4 Includes: Sleeper Sofa, Chair, End Table, & Coffee Table.